Part 2, wherein we find more beach stone curlews and bush stone curlews than we expect, and we finally catch up with some Cassowaries . For those of you who have followed our travels you will know that we have been hoping to see a Cassowary since first coming to Tropical North Queensland in 2001. Before we left Horseshoe Bay for Lucinda, we went on one last walk at dusk over to Rose Bay and back. What I hadn't counted on is that at dusk along the route we took there were biting instects. Lots of biting things which as either sandflies or smaller midgies. I can tell they aren't mosquitoes because the bites come up differently. I'm a reluctant expert. These are the bites which turn into bright red welts a few millimeters in diameter and only stop itching after a week. So they found me. itch itch itch itch itch itch itch itch itch itch itch itch itch itch itch itch itch itch Right,that's better. 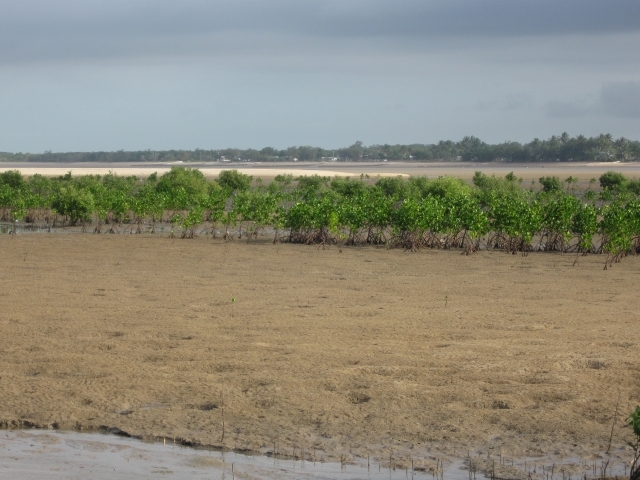 Our first port of call was a National Park where we camped at Alligator Creek. Yes, I hear you say, there are no alligators in Australia. We're all crocodiles here. But the early explorers/namers of places didn't seem to get it all correct. 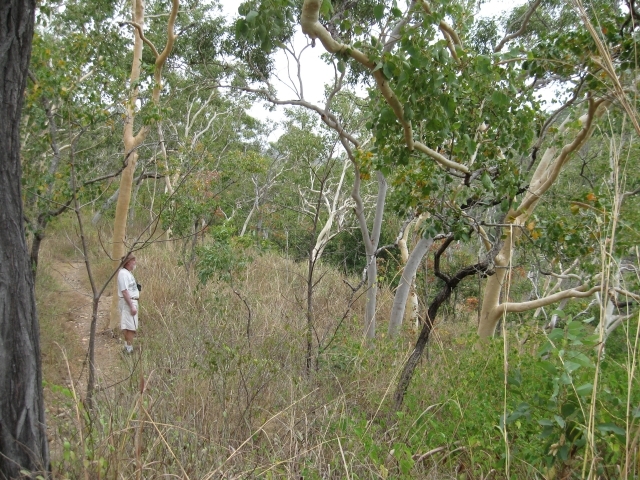 Anyway, we did a nice walk up a track to where Cockatoo Ck flows into Alligator. Here is your intrepid explorer gazing out through the drier forest down into the creek where the tropical rainforest is found. From Alligator Ck we went to a camp at Big Crystal Ck. There is a fantastic swimming hole here (croc free)but we didn't get a photo because the light wasn't right late in the day and we were focused on the swimming. Bliss. On to Lucinda where we have previously seen both Beach Stone Curlews and Bush Stone Curlews. Lucinda is an unusual place combining industrial and recreation. 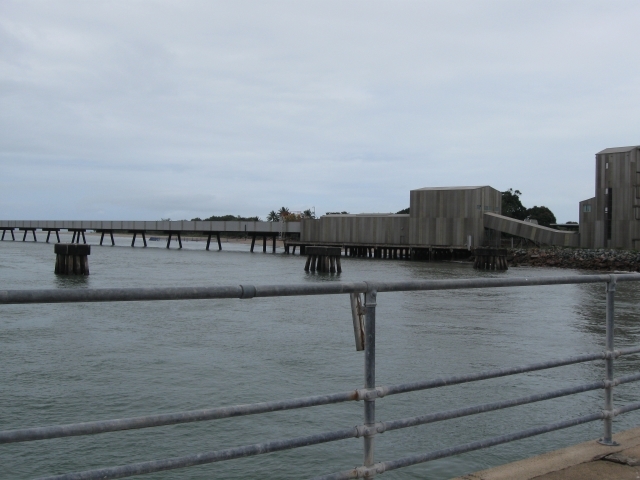 It is mostly about sport fishing and a nice sand spit/tidal area. But is also home to a 6 km covered conveyer belt system which takes refined sugar out past the reef so big ships can dock and pick it up. Loading happens in the middle of the night if that is what the tides dictate, and the conveyer belt sounds like a train going past for hours on end. But the wildlife and fish don't seem to mind. One of the most amusing things we came across was a fisherman pulling in what looked like a pretty big fish. His rod was bending right over. Then out of the water he pulled another rod and reel which looked like it had been in the water for a long time! When we first arrived we practically had to move the Bush Stone Curlews out of the way to set up camp. They like to hide by stealth and just sit there unless you get too close in which case the either hiss a warning or maybe move a few steps away. This one is resting on it's "elbows" and not being seen even though I am up quite close. They also have an evil eye which says to me "you just try and come closer". Either that or the sort of hooded look of Garfield the Cat. Curlews love to congregate in family groups in the night and give out with a loud blood curdling sort of cry. All night. Some kind of team building thing if you are a Curlew. Not so good for us when trying to sleep. Then, because they have been awake screaming all night they sit around being "invisible" during the day to recover. You have to work a bit harder to see the Beach Stone Curlews because they hang out on the spit hidden amongst mangroves and mud. There are two in this photo, but you may just find them if you enlarge it and look closely. 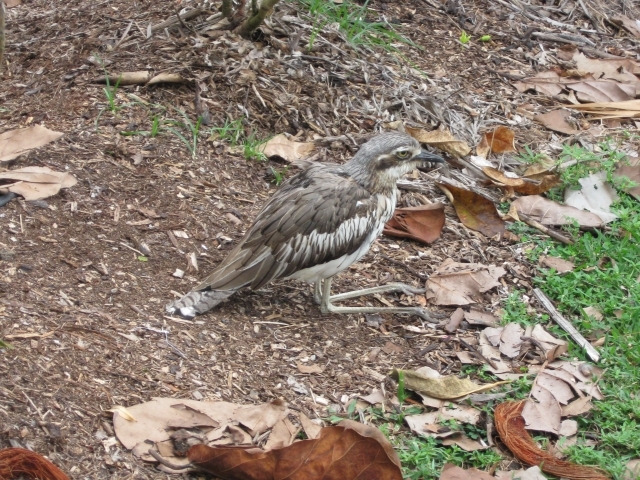 The Beach Stone Curlew is much rarer than the Bush version, and seems quite shy. People who bring dogs on the beach cause them to decide to more elsewhere so they are only left on relatively isolated beaches with good mud flats where they can feed. Also out on the spit are soldier crabs. 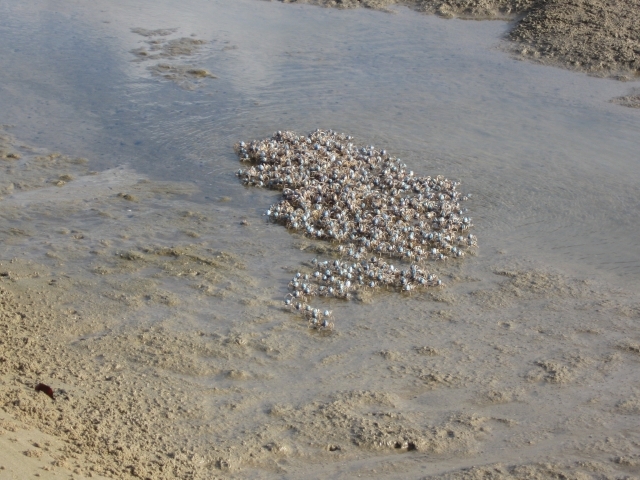 The soldier crabs all move as a group and go on manouvers across the spit. I caught up with them as they had formed up a platoon to cross a wet patch. They are hillarious to watch as they wheel about marching up and down the terrain in their little soldier helmets. 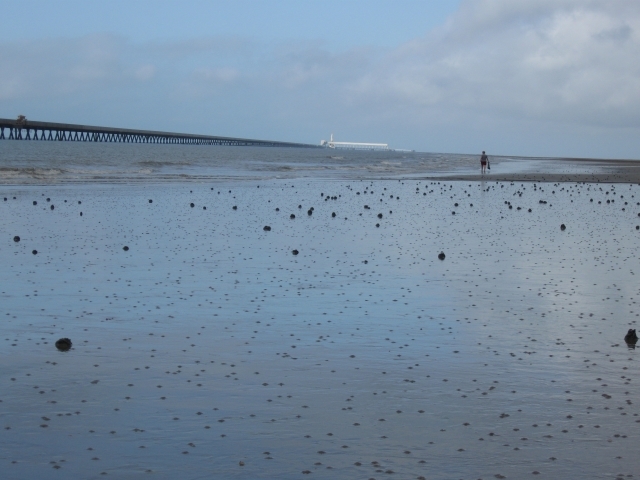 As we were trekking along the spit we also saw some strange lumps in the sand at a distance. On closer insepection they look like strange worm things sitting on the surface. Click on the photo and you can see the close up view. But enough sand art. In the background you can see the 6 km long conveyor heading off in the distance and the area where the ships dock. So all this nature and all this industrial stuff happens in the same place. 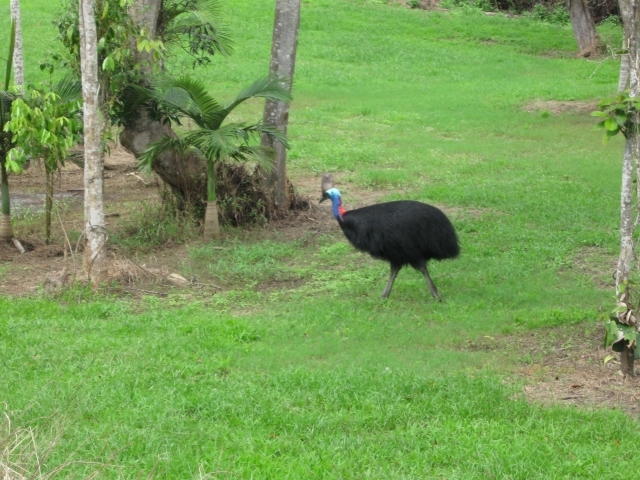 We headed off from Lucinda to South Mission Beach where we were stalking Cassowary. We didn't find any Cassowaries at Mission Beach (some near misses), but we did find an unexpected Beach Stone Curlew. This was on a trail from South Mission Beach over to Kennedy Bay. 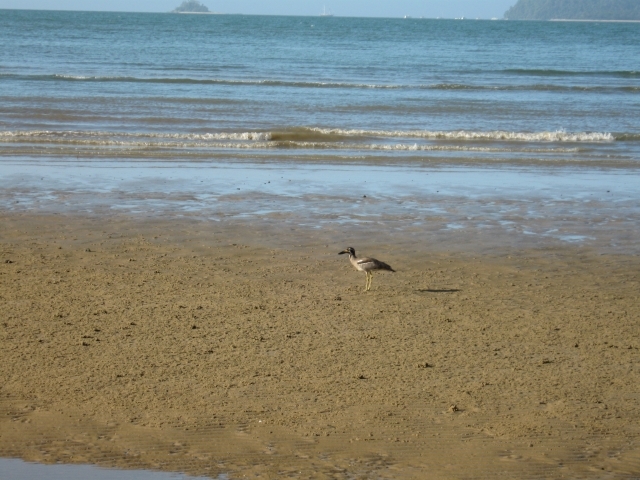 On a more remote beach in between we came across a Beach Stone Curlew out feeding on the mudflats. This one wasn't so concerned by our presence so we were able to get much closer. 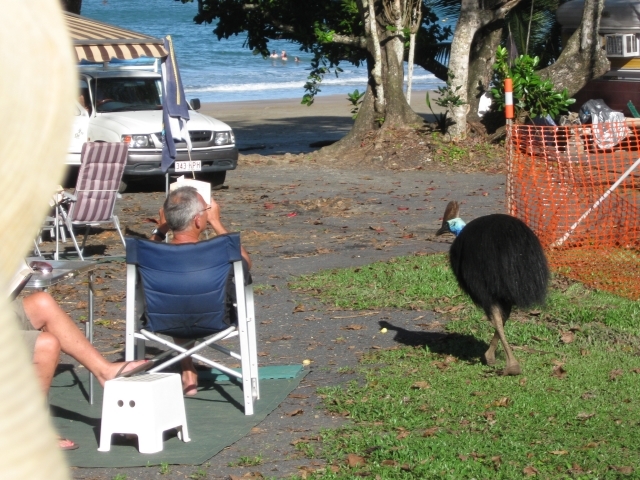 At Mission Beach people said "if you want to see Cassowaries, go a it North to Etty Bay", so we did. Etty Bay is a little gem of a bay. We arrived in the afternoon and set up camp, explored the beach, etc. A few hours later the first Cassowary came past our camp. Newcomers like us go crazy about them, but you can see that after a day or so you can get a bit non plussed as they wander past your elbow when you are reading. That is Jan's hat on the left side as she walked in front of my camera trying to follow the Cassowary. The orange safety tape is marking off a boggy area so people won't drive on it and make it worse. The whole coastal area was having lots of rain while we were cooling our heels back in Horseshoe Bay. Great timing. 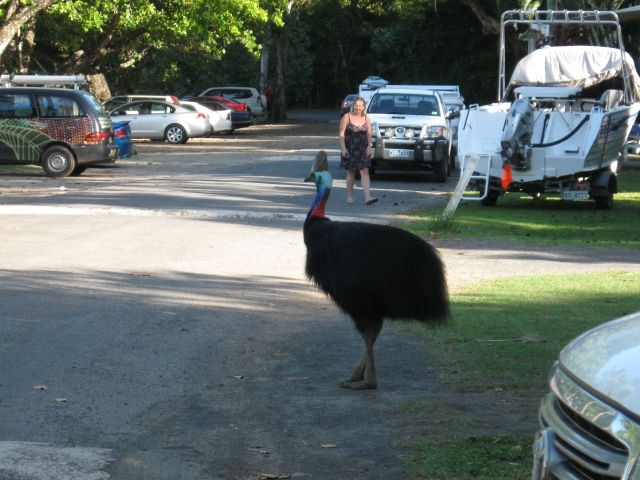 There are currently about 5 Cassowaries who have Etty Bay as part of their territory, and they aren't worried about just strolling through to check things out in the parking area. The only time I saw one slightly edgy was when some teens were bouncing a basketball near it. But they seem to accept us and we accept them as part of the scenery. We had 5 good sightings over two days, but probably only 3 different individuals. The locals can tell them apart (and have given them names) but we were only able to judge by size. We made an outing to nearby Mourilyan Harbour (yet another sugar loading industrial area) and on our way back we saw another Cassowary checking out somebody's garden. You can see the the area is mostly in grass but there are a few tropical fruit trees planted which must have been to her liking because she was picking them up off the ground. Loss of habitat has forced too many Cassowaries into browsing in gardens, and puts them at danger from dogs (despite those stout legs for kicking) and cars when they cross roads. Loss of forest corridors also means that when a cyclone roars through and knocks down lots of fruit trees, they can't move to another area as they used to do. All these factors mean Cassowaries are endangered and sadly declining in areas which have been heavily modified by humans. We also took a day trip to have a look at a few other nearby coastal sights before heading a bit inland. We visited a place called The Boulders. For obvious reasons. 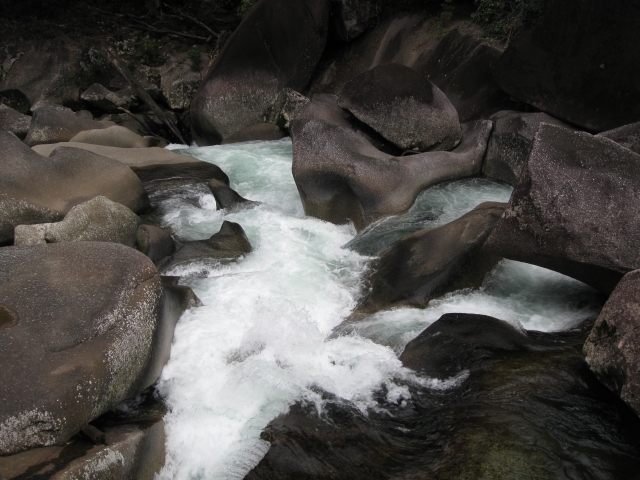 The Boulders is inland from Babinda, just North of Innisfail. This is portion of the park which is stricly no swimming with copious warning signs (and called Devils Gorge in case you missed the signs). There is a lovely swimming hole further upstream. 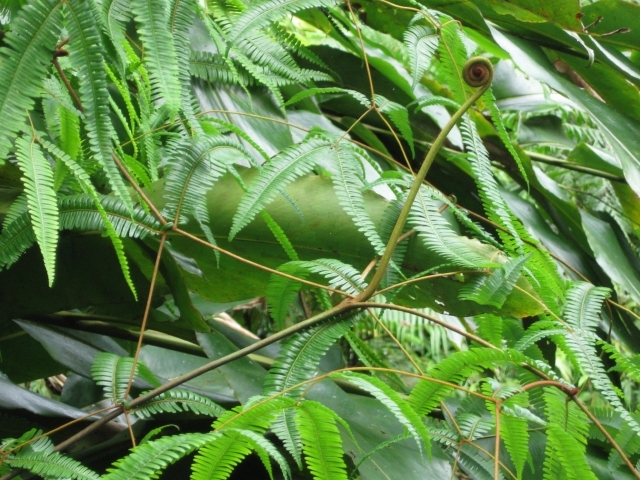 While we were in the dense rainforest we also couldn't pass up this unusual fern. It has a very unusual branching structure, and is a climber! But for us Kiwis it manages a very familiar Koru spiral. This day trip away from Etty Bay was also a relief becuase in addition to being a gem, all that rain really brought out the mosquitoes. So just after a week or so to recover from those sandflies itch itch itch itch itch itch itch itch itch itch itch itch itch itch itch itch itch itch all over again with a different sort of bite. Tropics. Sigh. This update is being posted from Atherton where we have been for several nights. We got here by leaving the coast and heading inland up the Palmerson Highway. The Atherton tableland is quite high (750 m where we are now) and much cooler than the coast. This area is familiar to us because we have been here several times before. We are enjoying visiting old places, and we always see some new and interesting things when we return. More on Tableland adventures later.